It’s been 20 years since Rivers Cuomo first sang about his sweater coming undone and his resemblance to Buddy Holly, and in that time he and his bandmates have gone through quite a fascinating and tumultuous ride. From Cuomo’s period of depression following the band’s critically panned but cult favorite sophomore release Pinkerton, to two other self-titled albums commonly referred to by their color that never quite lived up to the legendary “Blue Album,” to the suspected drug overdose-induced death of former bassist Mikey Welsh in 2011, Weezer have traveled a pretty unpredictable path full of various obstacles and detours. And it seems as though 20 years after releasing one of the most iconic albums of the 90’s, they’ve almost come full circle, proving that all their missteps and moments of bleakness have made them an even stronger band, capable of not only returning to their roots and reconnecting with the fans they may have alienated along the way, but also finding a refreshed sense of vulnerability and wit that makes this collection of 13 new songs more impactful and enjoyable than just about anything they’ve released since their mid-90’s heyday. 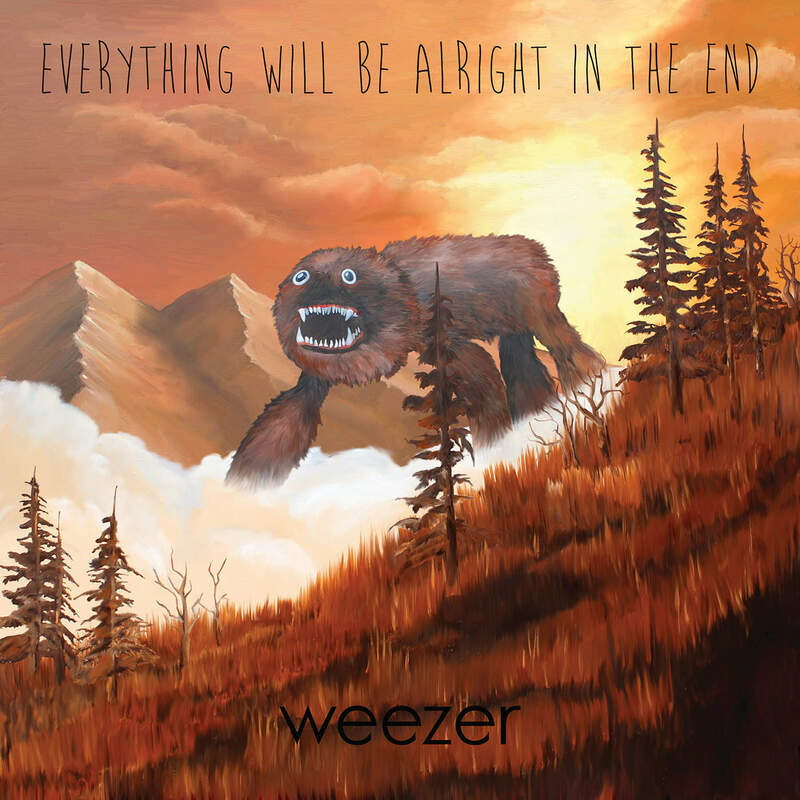 While it would be futile and rather unfair to try to compare the new album to Pinkerton or The Blue or Green Albums, Everything Will Be Alright In The End is full of the big rock anthems and fun, catchy power pop that made the band’s first three releases such fan favorites. The opening track, “Aint Got Nobody,” comes in with the same bold, poppy melodies, killer riffs and playful guitar solos that fans fell in love with years ago on tracks like “Say It Ain’t So,” “Why Bother,” and even “Hash Pipe.” The following track, “Back To The Shack,” is an insanely catchy, power pop anthem with a simple, repetitive chorus that reveals Cuomo’s witty insights into his tortured relationship with his fans and offers them a “sorry not sorry” sort of apology for the risks he and his band have taken throughout the last decade. Cuomo’s relationship with listeners is not the only one he attempts to lyrically amend; he devotes another group of songs on to his Pentecostal minister father, who recently came back into his life after years of estrangement. With “Foolish Father,” Cuomo seems to absolve the sins of his father and free himself from resentment, as he sings, “Forgive your foolish father/He did the best that he could do,” and is backed by a triumphant chorus who close the song with a reassuring refrain that bears the album’s title, “Everything will be alright in the end.” Yet another group of songs explores his relationship with women, the strongest of these being “Go Away,” an especially poppy and gently rocking duet with Bethany Cosentino of Best Coast and “Cleopatra,” an all out rock anthem in which he declares his freedom from a codependent relationship, while still wishing his lover the best. Everything Will Be Alright In The End certainly does its best to make amends on many levels and to reunite an iconic, influential and still very relevant band with fans they may have abandoned along their somewhat strange, divisive journey through the 2000’s. It seems Cuomo & co. have finally put the many experimentations and disappointments of their career behind them in order to return to what they do best: delivering massive, catchy rock anthems laced with just the right amount of ironic humor and introspection that will take listeners right “Back To The Shack” with them.